Everyone loves to change their smart phone at-least once in every twelve months. Upgrading smart phone gives mental and emotional peace. Therefore, many of them have the need to transfer data from one phone to another. In this article, we will share you a good method to transfer data from Acer device to other Android devices. This method of transferring data is not convenient, but perhaps, it is the most widely used technique around the world. Connect the Acer device to your PC with USB cord. Computer will detect the connected handset within few seconds. After the handset is detected, select "open device to view files" or "view files" option to open all the files and folders from your device. Now, simply copy all the folders that you wish to transfer to your new android device. Create new back-up folder in your PC and paste all the copied folders from your Acer device. Then, disconnect the device from your PC. Connect your new android device to your PC using USB cord. Select the "open device to view files" or "view files" option. Copy the back-up folder from your PC, and simply paste it in the new phone's folder. Disconnect the device from the PC, and restart your android device. Your new phone would detect all the transferred files. Usually, video files, audio files, images, text documents can open in almost all android devices. 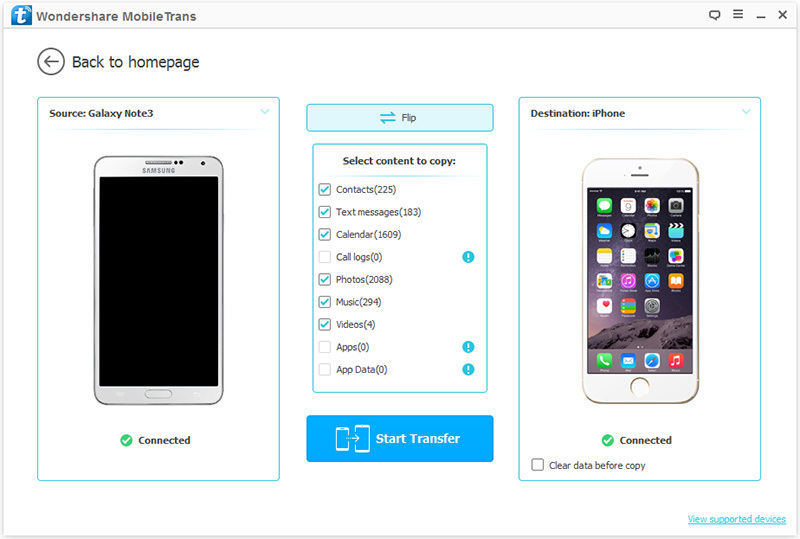 But unfortunately, this simple method for data transfer cannot be used to transfer contacts, text messages, apps, calendar, calls logs, and other phone records. To transfer your phone contacts from your old device, you can sync all the contacts with your Gmail or Outlook email app. Later, install email apps on your new device and sync contacts from your email with the new phone's address book. This will help you transfer all your contacts from old phone to new one. The need of the hour is a software solution that can transfer not just images, videos, and music, but should also transfer calendar, call logs, text messages, and contacts. dr.fone - Switch can prove to be the best option! 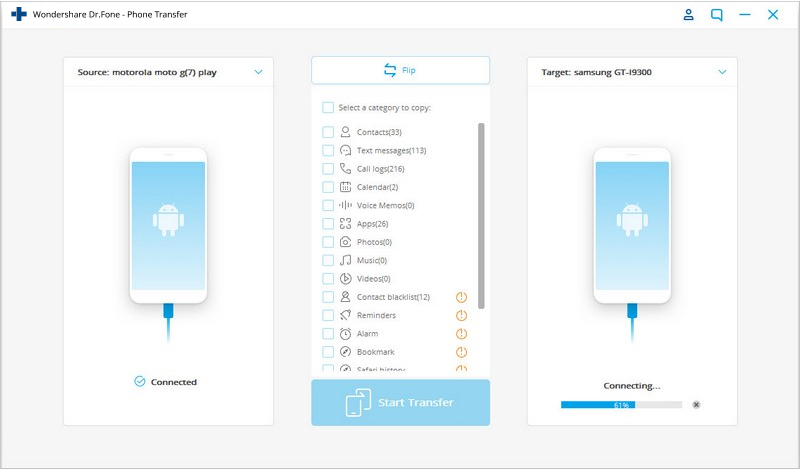 Transfer data from Acer device to other Android devices in 1 click! Easily transfer photos, videos, calendar, contacts, messages and music from Acer to other Android devices. Works perfectly with Apple, Samsung, Acer, LG, Sony, Google, HUAWEI, Motorola, ZTE, and more smartphones and tablets. Open the application on your PC or laptop. Then, use USB cords to connect your Acer device as well as the other Android device in which you wish to transfer the data. Once the devices are connected, dr.fone - Switch will show details about both detected devices on the interface. Select "Switch" mode to transfer data from Acer device to other Android devices. Within few seconds, dr.fone - Switch will show the list of files that can be transferred from Acer phone to the other Android device. Just click on the type of content that you wish to transfer, and click on "Start Transfer". 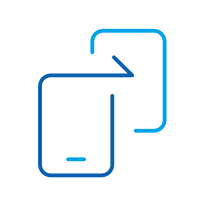 dr.fone - Switch will start transferring the selected files, and your new phone will be ready for use within minutes. dr.fone - Switch is rapidly gaining popularity because of its ability to transfer content between devices that work on various operating systems. This application is perfect tool for those who manage to buy latest phones immediately after their release. 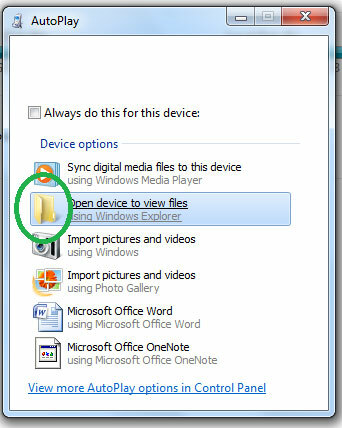 dr.fone - Switch can also create complete back-up folder for your mobile on your PC. If something goes wrong with your handset, or if you reset factory settings due to some issues, you can simply connect your device to your PC and reinstall everything with dr.fone - Switch. Which Acer device do you use? Besides Acer Chrome book C720, and Revo One PC, the Taiwanese company has also managed to attract customers with products like Iconia One 7 tablet, Iconia A1, Acer Iconia Tab 8, Acer neo Touch S200, Liquid Jade S, Liquid Jade Z, Liquid Z 500, Acer Liquid E700, etc. The company is all set to launch low budget phones, and tablets in the US this year. Get to know about five best Samsung transfer app out there. 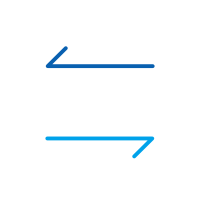 We have provided an in-depth comparison of all the leading Samsung data transfer tools. > How-to > Transfer > How to transfer data from Acer device to other Android devices?